Rami Malek plays the role of iconic frontman Freddie Mercury in "Bohemian Rhapsody". If you’re a film snob looking to find the perfect movie to satisfy your Kubrickian standards, perhaps it would be best to stay away from Bryan Singer’s biopic on Farrokh Bulsara, better known by his stage name, Freddie Mercury, former front man of the British rock band Queen. But, if you are in the mood for an entertaining and at times emotional delve into one of music’s most iconic figures, look no further than Bohemian Rhapsody. Without a doubt, this movie has its flaws, perhaps the most glaring being the breakneck speed with which the film barrels through most of its scenes. The first hour or so fails so incredibly at fleshing out singular moments in Freddie’s life and career that the film feels like a glorified montage. It takes no more than 10 minutes to transition from when Mercury first meets Brian May and Roger Taylor, the band’s lead guitarist and drummer, respectively, to when they are selling out concerts all over England. The overstuffing of moments takes valuable narrative space away from developing emotionally relevant storylines. Mercury’s home life, for instance, seems vital to the emotional payoff of the movie yet remains drastically underdeveloped. Though his family is introduced at the very beginning of the film and scatterings of their dynamic appear in other scenes, the relationships portrayed are one-dimensional and unworthy of carrying so much narrative weight. If Singer were to have spent more time expanding on the complex relationship Mercury had with his father instead of shoehorning in some superficial dad-wishes-son-was-not-chasing-his-rock-star-dreams plotline, I would have found the father’s eventual acceptance of his son far more impactful. Similarly superficial is Bohemian Rhapsody’s handling of Mercury’s sexuality and ultimately fatal AIDS diagnosis. Though they aren’t exactly glossed over, their lack of nuance left a bitter taste in my mouth. For the vast majority of the film, Freddie’s relationship with his manager Paul Prenter is depicted solely as rampant sexual desire, while his heterosexual relationship with Mary Austin (portrayed by Lucy Boynton) is presented as a loving and complex interpersonal dynamic. Additionally, the portrayal of Freddie’s AIDS diagnosis, while tragic, is significantly underplayed. The immense physical toll of the diagnosis, especially in a time when the disease carried such an awful stigma, deserves much more attention than the movie afforded it. In spite of all the missteps, Bohemian Rhapsody shines as a poignant and humanizing portrayal of a celebrity caught in a web of loneliness, regret, all-encompassing performative narcissism, struggles with sexuality, and love for his craft. The movie provides the viewer with insight into unexplored and harrowing sides to Freddie Mercury’s life story that cement his place in music history while also revealing the somewhat relatable obstacles he had to face. All of this is due in no small part to the absolutely breathtaking performance by Rami Malek. Throughout the entire film, I had to remind myself that I was watching somebody impersonating Freddie Mercury. 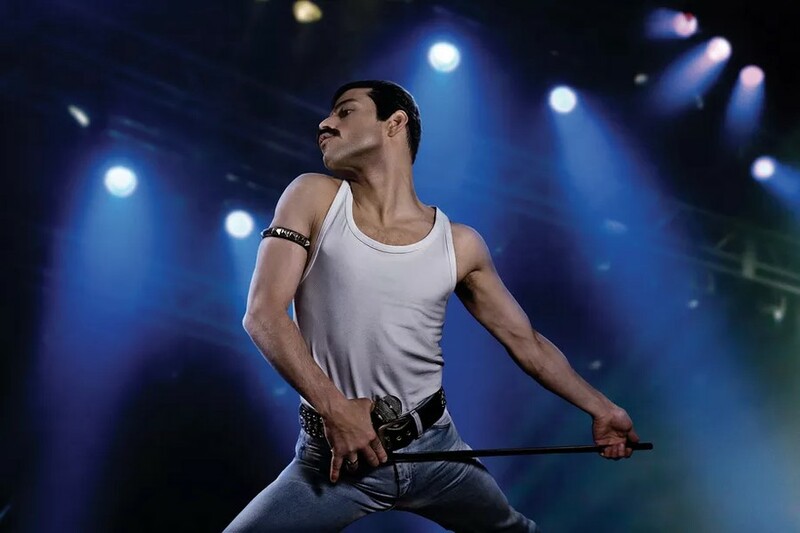 My familiarity with Queen’s front man, built over years of watching concert footage, was hijacked by Malek’s fantastic acting, costumes, makeup, dental prosthetics, and accent, making me suspend all disbelief and accept Malek as Freddie Mercury himself. It goes without saying that the soundtrack to the film is by far one of its strengths. There were moments throughout the screening when the audience sang along to the music, furthering the overwhelming feelings of nostalgia and passion already present in the film. Filled to the brim with iconic rock anthems, the movie certainly seizes every opportunity to make use of the rights they bought to Queen’s discography. For the most part, the songs are organically introduced (in concert scenes or scenarios of that kind), but occasionally, as in the cases of “Another One Bites the Dust” and “Bohemian Rhapsody,” the songs themselves play pivotal roles in narrative development. These less naturally introduced inclusions come off as a little forced, but work well into the campy tone of the movie. Anyone who goes to watch Bohemian Rhapsody is sure to come away with a new perspective on Queen and its powerhouse vocalist, songwriter, and heart: Freddie Mercury. Though some flaws stick out rather noticeably and the movie fails to portray Mercury’s life in all of its nuance, it undoubtedly succeeds in the category Freddie would’ve wanted it to: It entertains immensely.